Fran Kirby and Lucy Bronze have been nominated for the inaugural women‌s Ballon d‌'Or while Gareth Bale, Harry Kane and Cristiano Ronaldo are contenders for the men‌s award. Kirby‌s nomination arrives after she won the PFA Player‌s Player of the Year and Football Writers‌ Women‌s Footballer of the year for 2017-18 while Bronze added to her list of honours with a Champions League medal as well as a league title with Lyon. For the first time, France Football magazine is awarding the individual award this year to a woman and a man on 3 December in Paris. Liverpool are well represented on the men‌s 30-man list with Alisson, Robert Firmino, Mohamed Salah and Sadio Mané named while Chelsea‌s Eden Hazard and N‌Golo Kanté are also nominated. Despite his troubles at Manchester United, Paul Pogba is on the list along with one of the favourites to lift the trophy, the World Cup winner and Paris Saint-Germain forward Kylian Mbappé. Liverpool‌s Trent Alexander-Arnold is among the nominations for the first Kopa Trophy – an award for the best player under the age of 21 to be voted for by the previous 33 winners of the main award. In an outstanding debut season the full-back played in the Champions League final against Real Madrid before breaking into the England World Cup squad at the end of the campaign. Mbappé was also nominated in this 10-man shortlist, along with Borussia Dortmund‌s Christian Pulisic. Nominees for the Women‌s Ballon d‌Or: Lucy Bronze (Lyon), Pernille Harder (Werder Brême), Ada Hegerberg (Lyon), Amandine Henry (Lyon), Lindsey Horan (Portland Thorns), Fran Kirby (Chelsea), Sam Kerr (Red Stars Chicago), Saki Kumagai (Lyon), Amel Majri (Lyon), Dzsenifer Marozsan (Lyon), Marta (Orlando Pride), Lieke Martens (Barcelona), Megan Rapinoe (Seattle Reign), Wendie Renard (Lyon), Christine Sinclair (Portland Thorns). Men‌s award: Sergio Agüero (Manchester City), Alisson Becker (Liverpool), Gareth Bale (Real Madrid), Karim Benzema (Real Madrid), Edinson Cavani (PSG), Thibaut Courtois (Real Madrid), Cristiano Ronaldo (Juventus), Kevin De Bruyne (Manchester City), Roberto Firmino (Liverpool), Diego Godín (Atlético Madrid), Antoine Griezmann (Atlético Madrid), Eden Hazard (Chelsea), Isco (Real Madrid), Harry Kane (Tottenham), N‌golo Kanté (Chelsea), Hugo Lloris (Tottenham), Mario Mandzukic (Juventus), Sadio Mané (Liverpool), Marcelo (Real Madrid), Kylian Mbappé (PSG), Lionel Messi (Barcelona), Luka Modric (Real Madrid), Neymar (PSG), Jan Oblak (Atlético Madrid), Paul Pogba (Manchester United), Ivan Rakitic (Barcelona), Sergio Ramos (Real Madrid), Mohamed Salah (Liverpool), Luis Suárez (Barcelona), Raphaël Varane (Real Madrid). 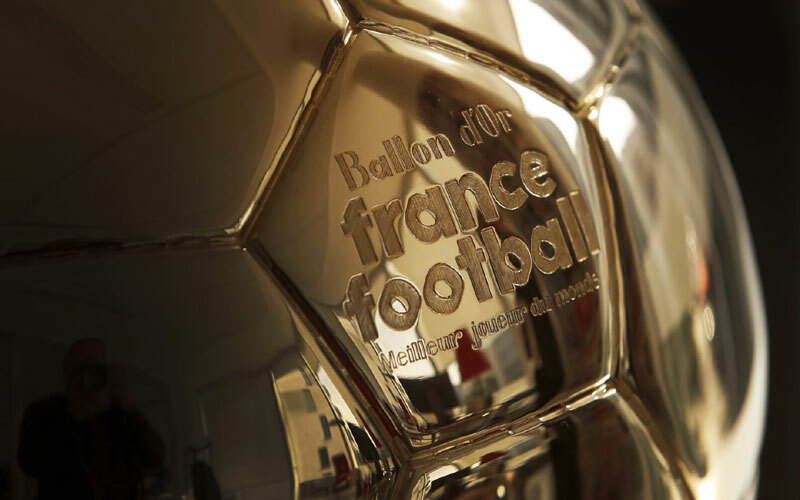 Nominees for the Trophée Kopa: Houssem Aouar (Lyon), Trent Alexander-Arnold (Liverpool), Patrick Cutrone (Milan), Ritsu Doan (Groningue), Gianluigi Donnarumma (Milan), Amadou Haidara (Red Bull Salzbourg), Justin Kluivert (Roma), Kylian Mbappé (PSG), Christian Pulisic (Borussia Dortmund), Rodrygo (Santos).